Recent Visit from Polish Distributor - extracellular matrix assays for use with mammalian cells, tissues and fluids. Jolanta Rutkowska, from Bioanalytic Maciej Stopa in Poland, recently visited Biocolor, Northern Ireland. 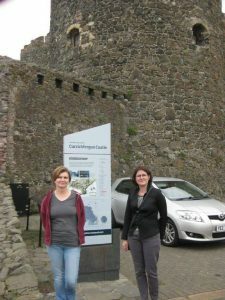 Kerry Allen (Logistics Manager, Biocolor) and Jolanta Rutkowska (Bioanalytic Maciej Stopa) visited Carrickfergus Castle.